The ACT government has announced that the Sapphire wind farm in northern NSW has 28 turbines in place and operating, and now helping to supply the ACT as part of its 100 per cent renewable electricity target. “Today is a fantastic milestone in the ACT’s transition to 100% renewable electricity,” the minister for climate change and sustainability Shane Rattenbury said in a statement. The Sapphire wind farm will reserve 100MW of its capacity as part of its contract to the ACT, although the whole project will total 270MW – and may be joined by a solar farm and battery storage in the future. The facility is located 18kms west of Glen Innes in the northern Tablelands, and is one of a number of wind and solar projects in the heart of the New England electorate of former deputy prime minister and ex-Nationals leader Barnaby Joyce. Owned by CWP Renewables, it will be the largest wind farm in the state once completed, overtaking the nearby White Rock wind farm. Other facilities contributing to the ACT’s 100 per cent renewables target include the completed three stages of the Hornsdale wind farm in Victoria, the Ararat and Coonooer Bridge wind farms in Victoria, and the Crookwell wind farm in NSW. The latter two stages of the Hornsdale wind farm will not start contributing to the ACT target until the formal start of their contract in 2018 and 2019 respectively. Rattenbury said the Sapphire wind farm will bring many local investment benefits to the local community. “As we have seen with other renewables projects, there will be significant flow-on benefits to the Canberra region through this wind farm,” Mr Rattenbury said. CWP, which moved its headquarters to Canberra as part of its tender for the project, is also establishing an investment model that will provide an opportunity for the local community to invest in the project. The remainder of the wind farm is likely to be completed by the end of the year, with the bulk likely to be contracted to another third party. CWP has said that it is considering a 200MW solar farm and battery storage to supplement the wind project. Other major wind projects, including White Rock, Gullen Range, Snowtown, and Kennedy, are also adding, or already added, solar to their wind facilities. CWP expects to make a decision on the solar project in the third quarter of this year. Can anyone explain how this clean energy gets from Glen Innes to the ACT. It doesn’t. The energy goes into the grid and the ACT takes an equivalent quantity out. But that would mean that most of time the ACT is running on dirty coal power. Confused. Bit like a bank. If you go into a branch and deposit $50, and then three days later you take it out at an ATM, the chances are that it is not the same $50 note. But it is your money all the same. But remember that someone else is “running” on that clean energy. You can’t track every single electron from source to sink but ultimately there is more “green” electrons in the system and fewer “coal generated ones. The ACT now has running contracts with 4 solar farms in the ACT, 2 wind farms in Vic, one in SA and one in northern NSW. That’s a nicely diversified mix. Clearly the generation is not going to exactly match the ACT’s demand on a second to second basis, but there is likely to be reasonable generation from at least one of these generators at any given moment. No mention of the Capital Wind Farm on ACT’s doorstep. 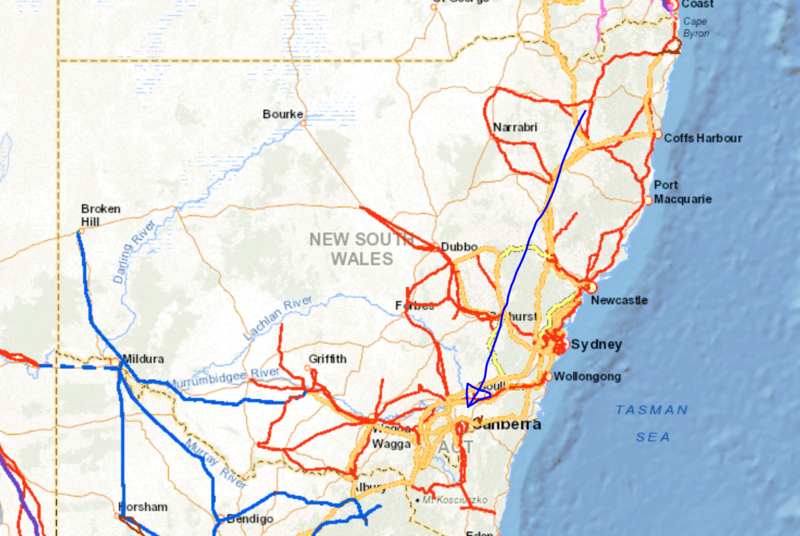 I know it “powers” the Sydney desal plant rather than the common grid, but when talking about NSW’s biggest windfarms, it has well over 100 2.1mW wind towers so it must still be one of the biggest………..
Capital wind farm consists of 67 turbines, or 140.7 MW in total. However it is right next to the Woodlawn wind farm (same owner), which has another 23 turbines or 48.3 MW. So between the two projects, that adds up to 189 MW. Ah – didn’t realise stage 2 hadn’t happened yet. Cheers. The big dirty secret is that after the tornado on 15 Dec 2015 – the desal plant has remained out of action and is believed to have been selling (at a substantial profit) the power it has supposed to have been using to provide drinking water. So not only is is being paid for being out-of-action it is profiteering as well. Worse still – both the State Govt and ALP opposition (as well as the Greens) have been remarkably silent about this. Why is this? Which well known investment bank is involved? Or is this just another issue the ICAC has been hobbled over and cannot investigate? It has got so bad that the inlets on the feed-in pipes have been blocked by barnacles. That’s some pretty saucy intel there Andrew. Very interesting. Are independent MPs aware of this – surprised someone isn’t asking questions and making this the big news item it shuold be……. When the top donors to both sides of politics are the same, and past politicians/senior bureaucrats work as consultants for the same companies then the saying “Not biting the hand that feeds you” comes to mind. Like with the CSELR, an independent audit in August 2914 proved it is cutting public transport passenger capacity from Kingsford/Randwick to Central/Circular Quay vs the 20 bus routes it is to eliminate (including the UNSW express services) – in the morning peak hour by over 10,000 passengers an hour. I took this to the ALP, Greens etc etc and all said they would run with it. They didn’t, they lied and kept coming up with excuses until post the 2015 State Election when they stopped answering. I took it to the NSW Auditor General’s team, including the revelation that the senior company in the winning consortium (Alstom) had admitted to setting up two depts with the sole purpose to bribe politicians and senior bureaucrats around the world to win transport & power projects. Odd how the NSW AG Investigation report states there was NO issue with due diligence though!!!! Change of State Auditor General did occur between investigation and final report coincidentally. See the admissions document Alstom released to the US Dept of Justice after being hit with a AUD $1.1bn fine less than a week after Baird gave them the CSELR. This was widely known since late 2013 btw. https://www.justice.gov/…/alstom-sentenced-pay-772-million-criminal-fine-resolve-fo…Nov 13, 2015 – Represents Largest-Ever Criminal Foreign Bribery Fine … Assistant Director in Charge Paul M. Abbate of the FBI’s Washington Field Office made … U.S. subsidiaries, both entered into deferred prosecution agreements on Dec. Turned out they have been investigated for bribery on EVERY other continent BUT Australia – and prosecuted on every other continent. Nothing like getting 48 hours of the Paris based Board of Directors talking about paying off politicians around the world – to get a company to finally roll over. Sending shoe boxes of USD 100 notes from Switzerland was a neat way to leave no electronic trail. It’s exciting seeing how much new RE is being brought online, and new projects being announced. Nice analogy in the ATM Giles, Horsndale S.A. not Vic.